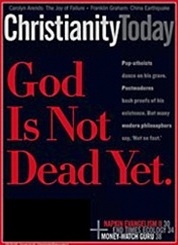 The last couple of days I’ve been working on a response to “God Is Not Dead Yet,” the current cover article of Christianity Today. Since I’m working on a project about proofs for the existence of God, I couldn’t help but want to tackle this meaty piece by the prominent evangelical apologist William Lane Craig. Quite without being planned as such, what began as a post for The Row Boat erupted into an article that the folks over at Religion Dispatches were kind enough to pick up. In what follows, he combines a tango through some of the major traditional arguments for God’s existence (almost exclusively in terms of their modern celebrators) with a revealing discussion about the performative place of natural theology—the study of God through nature’s evidence—in modern culture. This entry was posted in Blog and tagged atheism, existence of God, logic, religion & science. Bookmark the permalink. Tom Gilson over at Thinking Christian has posted a generous reply to my article, inspecting certain carelessnesses on my part and digging a little further past the article itself than I did. For that I am grateful. His remarks make me think more highly of the Craig article than before, which is a good thing. In places I overdid the characterization of Craig as insular. Evidently, that is, I have done what I accuse Craig of, and what I hope to avoid: getting carried away by an enthusiasm and thereby drawing more lines in the sand: theist/atheist, and the rest. I hope that in the latter part of the article, which put Craig in dialog with Barth, I have succeeded more in what I see as my objective in these dealings with New Atheists and the like: to break down some of the oppositions that make groups of people seem like a different species to each other. Nathan, thank you for that word of encouragement, and for your impressively gracious example here. I think you have quite correctly understood Craig’s response to Barth. I should have said so in my blog article. Craig would say, I think, that if Barth is right and that a part of human nature should be bracketed as you put it, then there is a bifurcation of truth and reality, which violates what he takes (as do I) to be the nature of God and of truth. So if there is a risk associated with relying on natural theology, he is willing to take that risk. Yet in his book Reasonable Faith he makes a strong distinction between knowing God (or that there is a God) and showing there is a God. For knowing God, he states emphatically that the proofs are not necessary; that God can make himself known directly and immediately to the person, resulting in that person having real knowledge of God apart from natural theology (though not apart from Biblical revelation). Obviously most Christian believers came to belief without the study of syllogisms, and furthermore the Bible teaches that this is one role of the Holy Spirit. The CT article is much more about showing that there is a God. Craig is obviously quite optimistic that we can make a very plausible case for this (he does not say “prove,” as far as I know). When you share your faith, you’re asking the person to believe that a man who lived 2,000 years ago was perfect in his character, possessed all wisdom, was actually God in fact; that he raised people from the dead and himself rose up from the dead; and that he makes all the difference in your life today. Now, on the face of it, how believable is that? There is a plausibility barrier there for most members of Western culture. If Craig is right, the advance of Christian scholarship is showing that this statement is really not so implausible at all, and that one can accept it without giving up one’s own good sense. I’m a theist, broadly speaking, but have no patience for the dishonesty of claiming rationality per se leads anywhere but agnosticism. I think it’s telling that Craig doesn’t so much as mention the whole issue of theodicy. The article reads like a “who’s who” of proof-believers, rather than an upfront engagement with the thornier issues. IMO, you’re right to point out the misplaced “personal” qualifier (at least in relation to rational arguments for God), the importance of Barth’s counter-stance, etc. There’s an absurd irony of C. mentioning “intelligent design” as if it’s legitimate science, then holding up “science” as the basis for objectivity (“People are not relativistic when it comes to matters of science” — well, Craig apparently is). I don’t fault Christians for wanting to uphold a philosophical culture than could accommodate the value of faith, but being naive at best, or misleading at worst, about the limits of rationality doesn’t benefit anyone. It just fuels the fire of the other, “atheist” extreme (vs. agnosticism, when it comes to rationality per se). Until *both* rationally-based atheists and theists get over their counterclaims for what “reason” alone can prove, they might as well be different specifies to each other, intellectually at least. I don’t think it’s anything to apologize for, though, so much as a fact of life. …if Barth is right and that a part of human nature should be bracketed as you put it, then there is a bifurcation of truth and reality, which violates what he takes (as do I) to be the nature of God and of truth. No, if Barth is right it just means that different *human* faculties have different limits. It’s not a limit on God or truth, but just a function of *our* various limits. For example, it’s completely presumptuous to argue that God should have established or tolerated our own limits differently, just so we would presumably have an easier time “proving” Him (!). The knowing/showing distinction is a fine one, but somehow in practice showing-claims always seem to end up masquerading as knowing-claims — for example, contra Tom, Craig *does* write at the beginning of his article that natural theology is “that branch of theology that seeks to *prove* God’s existence apart from divine revelation,” etc. Also, the rational arguments for God are completely separate from issues of dogma or denominationalism anyway, etc. Paul didn’t argue Christ as “good sense,” he argued Christ crucified, an *acknowledged* folly and stumbling block! Glad to see you commenting here again! I’d missed you! You make great points here. I was thinking of bringing Paul into the discussion too—something about all these seems oddly unbiblical. As usual, I’m not quite as confident as you about the ability to so cleanly demarcate between what human reason is capable and what it is not, but your point on Barth stands nevertheless. He speaks so firmly from the position of human Fallenness (perhaps why he felt so warmly about William Stringfellow). In contrast, attempts at proof seem positively Babel-like. Well, now that I’ve posted equally-testy posts about a rational atheist (MCT) and a rational theist (WLC), maybe I’ve balanced my comments out? I appreciate your taking the time to consider my piece, Dr. Craig. You make some important points, most of which were pretty much captured in Tom Gilson’s piece (which he links to above, as well as my response). Let me reiterate though: I think I made clear in the passage you read that I had no intention of aligning your project with Nazism. By this point in the article, I am past critiquing your article, and instead I turn to reflect on it more broadly. Drawing attention to Barth, I merely mean to show readers another, distant but related discussion about natural theology in a very different context, revealing some of the reasons why theologians in the past have given pause to it. I am no Barthian, and nowhere in the article do I endorse Barth, other than to point out his undeniable stature among 20th-century theologians. The purpose of this point is to suggest how religious ideas, even the most abstract proofs, fit somehow in political contexts. I am interested in your distinction between “knowing” and “showing” – and of course you are not the first to make it. I don’t deny your distinction on principle, but I am fascinated by the permutations of it in practice. Can the two be kept apart for long? Perhaps among philosophers. But modern culture seems, in strange ways, to place the indwelling Holy Spirit in movements of technology and science. First the intricacy of nature becomes a way of showing God exists, but then there are Christian raft tours of the Grand Canyon where the showing becomes a spiritual experience – undeniably a sensation of knowing. And then I think of Pastor Haggard’s World Prayer Center in Colorado Springs, where one can’t help but think that the very servers bringing in prayer requests have become tentacles of the Holy Spirit. When something like Big Bang theory becomes a statement [i]about[/i] God, practicing it inevitably comes to feel like being [i]with[/i] God. I wonder, for instance, how you place your arguments in your own spirituality. Are they plainly a duty to be carried out (of course in the gladness of serving God), or are they, in themselves, a devotional end? Update: Dr. Craig’s site has yet to post my comment. Apparently conversation is not the point. Dr. Craig gets the last word. Update on the update: The comment is now up, thanks to ChristianJR4. It seems there was some kind of technical problem before. I certainly apologize (again?!) for unfair accusations against Dr. Craig! That said, I am in 100% agreement that the more interesting side of the discussion was with Barth, etc. As I’ve already confessed elsewhere, I think I got a little carried away tangoing with the apologists in the first part of the article and lost sight of the big picture. To me, in fact, the difference between the God of the philosophers and the God of the Bible is less a reason to dismiss natural theology completely as a reason to explore why people find it so compelling. I am in the process of writing a book on the subject. It certainly isn’t my interest to disparage natural theology in general—that wasn’t why I brought up Barth (nor was it, as Dr. Craig seems to think, to compare him to Hitler). The intention, rather, was to show that, as times and circumstances change, the terms under which theological debates occur can be radically different. Here I meant to add to, not to subtract from, Craig’s interesting reflections on natural theology in culture. This all reminds me of a time when I was hiking in the Sierras for three weeks, with no contact with civilization whatsoever. I brought a Bible along. A few days into the trip, I tried reading it and couldn’t believe how irrelevant it felt—what was the point of all the kings and prophets and poetry and so forth when I was surrounded by the Glory and the Silence already? It is odd how, even though the Gods of nature, philosophy, and the Bible (or even different books of the Bible) are so different, they find their way to a similar place in people’s hearts. Thank you very much for clarifying this, ChristianJR4. It seems there was some kind of technical problem before, but now the comment is up. I certainly apologize (again?!) for unfair accusations against Dr. Craig! The written reply is different from his audio blog but the main points from the audio are highlighted in his written response. Nathan if you haven’t received any response from Craig yet you’re best shot is to post a reply at the EPS blog. Christian, thank you for your diligence in all this! I have done as you suggested.